Welcoming a new employee is more than making a company announcement and a boss assignment. Welcoming a new employee, to give the new employee the best possibility of integrating successfully in your company, requires a series of steps that start after your job offer is accepted. Integration and retention of your new employee start during the hiring process, and they also intensify when the new employee starts the new job. You have a lot at stake in how you welcome your new employee. These recommendations will help you get it right. These welcoming steps for the new employee continue right into his or her employment. If you do these welcome and onboarding steps well, you will create a successful new employee. Here's how. If you follow these recommended steps, your new employee is set up for success. Contact the new employee shortly after he or she signs and returns your job offer. The purpose of the note or phone call is to express your excitement that the new employee has joined your team. This call is best made by the hiring manager, the employee to whom the new employee will report. Set up the expectation that the new employee will hear from you regularly during the normal two-four weeks before the start day. Send benefits information and the employee handbook early so that the new employee may review them at his or her leisure and arrive for the first day with questions. You may have other documents that are pertinent to your business to share as well. If these are online, provide the employee with a link and early access. These actions contribute to the trust you are establishing with the new employee. If your organization has an online wiki or another intranet, provide the new employee with early access. This is especially important if you have an online staff directory with photos of employees. Your new employee will feel as if he or she is getting to know coworkers early. Lacking an online photo album, consider setting up an employee bulletin board in each department with employee photos and other business and employee information. Or, do both. Send an official company welcome letter from Human Resources. This welcome letter for the new employee should contain a confirmation of such items as start date, start time, work dress code, where to go, the first day's schedule, and other details that the new employee needs to know. Assign a new employee a mentor, a more experienced employee with no reporting relationship to the new employee. The mentor should call the new employee to get to know him or her before the start date. Prepare for the employee’s first day by having everything ready for his or her arrival. An earlier article stresses the ten best ways to turn off a new employee. Many of them have to do with the organization’s failure to prepare to welcome the new employee from day one. These items seem so simple. For example, don’t ask an employee to start during a week when his or her new boss is out of town. Don't schedule a new employee without preparing their work area. Demonstrate respect for the new employee. Develop a checklist for new employee preparation that includes assigning a computer or laptop, installing software programs necessary, preparing a desk and cubicle or office, providing mail access and an email account, and so forth. Every office needs a list and an employee assigned to make the items happen before the new employee starts work at their new job. Decorate the new employee’s office area with welcome signs, flowers, and snacks. Let the quirkiness of your employees and work culture shine through in the items that you provide to welcome the new employee. Company swag is appreciated, too. A mug with the company logo and other items that welcome the new employee will make him, or her feel quickly at home. Make sure that the first day's schedule is full of meeting people and onboarding activities. Schedule a good portion of the morning with the new employee’s boss and mentor. This is your last chance to make a positive impression on your new employee. Don’t let the day go to waste and contain nothing but paperwork and HR meetings. The day is for bonding with the boss, the mentor, and coworkers not about filling in forms. Prepare an onboarding schedule in advance that is customized to the needs of the department and the new employee. Make sure that the onboarding schedule fills only part of each day so that the new employee can feel productive immediately in his or her new job. One company required that the employee’s manager put together a 120-day onboarding plan that provided something new for the employee to learn every day. The employee’s boss and mentor are responsible for creating, sharing, and monitoring the onboarding schedule. Make sure that the new employee meets with Human Resources staff on the first day so he or she can ask questions about benefits, policies, and compensation. HR cooperates with the manager and mentor to tell the new employee what he or she needs to know and to introduce the culture and the organization’s expectations of employees. This is also an opportunity to begin communicating the value of your comprehensive benefits package. Schedule lunch on the first day with the new employee’s coworkers and set up a schedule to make sure that he or she has a coworker with whom to eat each day of the first week. The new employee’s boss and mentor should also attend this lunch. The goal is that the new employee has the opportunity to meet many new coworkers from across the organization so they feel welcomed and part of their new workplace. The impressions the new employee forms during the first few days and the onboarding period will have an enormous impact on the new employee's experience of your organization. 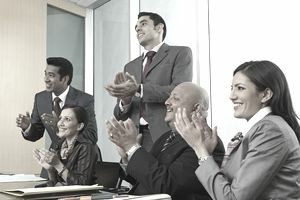 It is well worth your time and attention to make the new employee's welcome positive, affirming, and exciting.